Kearney’s 2013 alfalfa and forage meeting provides diverse tools to the agriculture community. The recent alfalfa and forage meeting at Kearney attracted about 100 growers and pest control advisors. Shannon Mueller, UC Cooperative Extension advisor and director in Fresno County, agronomy, alfalfa, hay, forage crops, honeybees, seed oil crops, and dry beans, indicated that grower knowledge of the local pest and disease pressure and selection of an alfalfa variety with desired resistance qualities is an effective IPM tool for managing pests and disease in alfalfa crops. Dan Putnam, extension specialist in the Department of Plant Sciences at UC Davis, agronomy, alfalfa and forage crops, alternative field crops, cellulosic energy crops, crop ecology, shared that some of the nitrogen produced by alfalfa (a legume) remains and is available for subsequent crops. Current research has a goal of developing alfalfa’s nitrogen credit to help manage nitrogen fertilizer supplementation for non-legume rotational crops (like wheat). Putnam also shared the potential value of sorghum as a summer irrigated forage crop for dairy and livestock production that requires less water and nitrogen as compared to corn (California’s main forage crop). 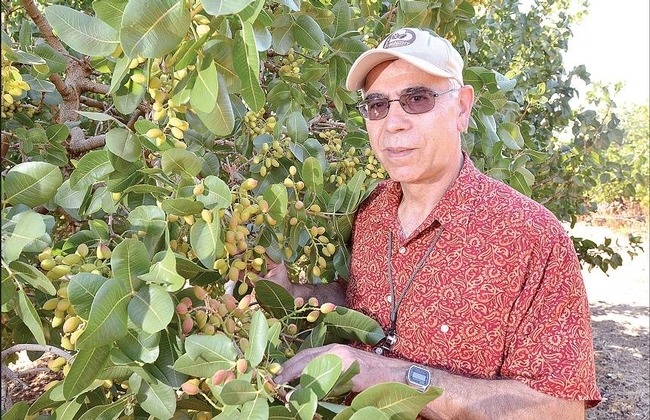 Research on the sorghum is ongoing, with benefits and limitations being identified. Michelle Leinfelder-Miles, UC Cooperative Extension advisor in San Joaquin, Contra Costa, Sacramento, Solano and Yolo counties, crop production, soil and water quality, the Delta, discussed concerns and management strategies related to the co-existence of Roundup Ready (RR) alfalfa and conventional alfalfa. Gene flow between seed producing alfalfa fields has been observed. Gene flow between hay producing alfalfa fields is mainly prevented by management barriers, particularly the cutting of hay at a stage that minimizes any seed development. Best practices to allow growing and separating both RR and conventional alfalfa were discussed. Additionally, growers can use test strips that allow easy and quick detection al RR alfalfa if customers do not want any RR alfalfa. Jeffery Dahlberg, director at Kearney Agricultural Research & Extension Center, plant breeding, agronomy, field crops, sorghum, plant production, plant genetics, discussed sorghum variety trials designed to assess many characteristics, including water use, fertility, forage quality and yield. Dahlberg indicated that sorghum serves as a grain and forage crop for livestock, and biofuel crop. Robert Hutmacher, cooperative extension specialist and director at West Side Research & Extension Center, cotton production issues, water stress, nutrient management, indicated that water conservation is a high priority. Hutmacher highlighted water timing and reduction research that indicated that although yields are lowered with less water, acceptable sorghum crop yields can still be obtained. Yields of grain sorghum were impacted less than yields of forage sorghum with reduced water use. Steven Wright, UC Cooperative Extension advisor in Tulare and Kings counties, cotton, small grains, weed control, discussed how nitrogen/wheat variety management strategies help maximize both yield and protein levels while minimizing ground water contamination in growing areas. Larry Godfrey, UC Cooperative Extension Specialist in the Department of Entomology, UC Davis, entomology, discussed the Blue Alfalfa Aphid, which caused extensive economic damage throughout California last year. The Blue Alfalfa Aphid was a major problem in the 1970s, and a minor problem in the interim. The pest management materials that were effective historically were not effective last year. New pest management strategies have been developed and a new use registration and/or section 18 use permit are pending, hopefully in time for the 2014 alfalfa growing season. 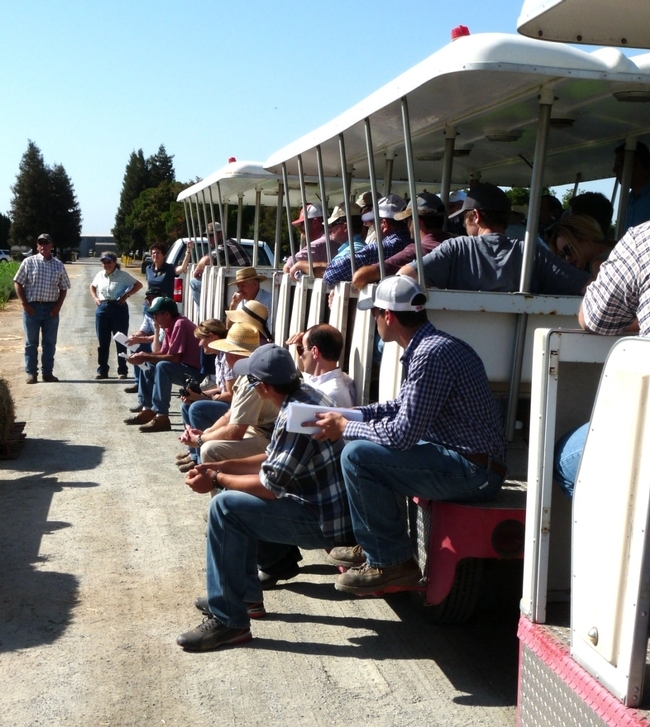 Kurt Hembree, UC Cooperative Extension Specialist in Fresno County, weed management strategies in crop and non-crop settings, discussed weed management strategies for RR and conventional alfalfa stands. Hembree indicated that best practices are to design weed management strategies according to existing and anticipated weeds with extra weed control effort during early stand development. Hembree stressed that if growers want to preserve the benefits created by RR alfalfa, they need to reduce the chances of weed resistance to glyphosate with escapes control, mode of action rotation, and/or tank-mixing with other herbicides. For more information, please look at the California Ag Today blog.